Davis Okoye (Dwayne Johnson) is a man who keeps people at a distance but shares an unshakable bond with George, the extraordinarily intelligent, incredibly rare albino silverback gorilla who has been in his care since he rescued the young orphan from poachers. However, a rogue genetic experiment gone awry mutates this gentle ape into a raging creature of enormous size. To make matters worse, it’s soon discovered there are other similarly altered animals. In a world where we feel increasingly unsafe, where we believe that the super rich are only interested in generating more wealth no matter the cost, only one thing is certain. We all need Dwayne ‘The Rock’ Johnson by our side. Only he can make us feel safe, remind us of what is important and save us from catastrophe. Only he could take a film with a story as crazy as Rampage and give this rollercoaster ride heart. 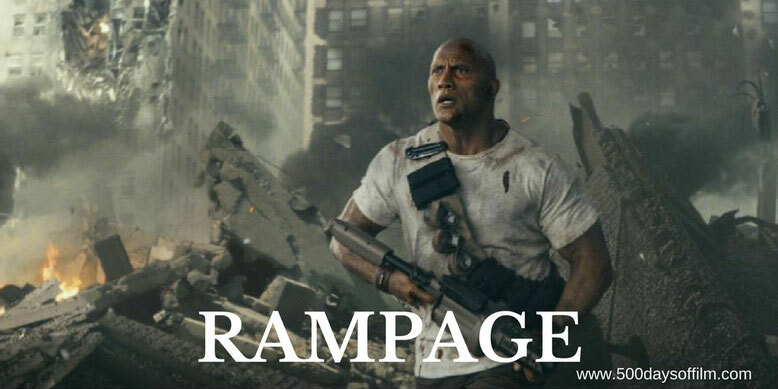 Without the charisma of Dwayne Johnson, Rampage simply would not work. Without him, Brad Peyton’s film would be just another bashy smashy CGI bore. Johnson has the ability to sell Davis’s intimate and endearing relationship with George (a wonderful mo-cap performance from Jason Liles) and also refrain from taking himself or the plot too seriously. This balancing act enables us to feel connected to the emotional centre of the story (the friendship between Davis and George) while also laughing at the sheer ridiculousness of it all. Rampage also features the always brilliant Naomie Harris and a scene stealingly delicious performance from Jeffrey Dean Morgan. Both more than sell the film’s bonkers narrative and humanise this CG extravaganza. Rampage’s CG effects are pretty impressive - despite a few shonky moments. George looks incredible and the other monsters are, shall we say, interesting looking beasties. The sheer scale is awesome and the final scenes suitably destructive. However, I couldn’t help feeling unsettled by the rather flippant loss of life in Rampage. Perhaps this belies the film’s video game roots but it occasionally felt rather jarring. So too did the scenes of buildings falling - uncomfortably reminiscent of the horrendous events of September 11th 2001. However, perhaps this was deliberate. Perhaps it was designed to reflect our fears for the world today and reassure us that we can still be rescued - that the very best of humanity can save us from the very worst. Rampage roared to the top of the UK box office during its opening weekend with a three-day debut of £3.1m from 559 sites, an average of £5,617. Rampage recieved a 12 rating from the BBFC for "moderate violence, threat, brief gory images, rude gestures". While I would agree with this rating, the language, threat and violence in Rampage pushes it towards the top end of 12-rated movies. Brad Peyton directed Rampage from a screenplay by Ryan Engle and Carlton Cuse and Ryan J. Condal and Adam Sztykiel. If you have, what do you think of this movie? Let me know in the comments section below or you can find me on Twitter @500DaysOfFilm.